The STEM Conference planning team wish to cordially invite you to the Science, Technology, Engineering and Math (STEM) Parent Conference. Saturday May 14, 2016 at Richview Collegiate Institute, 1738 Islington Ave Etobicoke, ON, 8:30am – 3:30pm. Dan Riskin (Discovery Channel’s Daily Planet Show) will be at the conference again to interact with conference participants. “I AM STEM”… Empowering Parents to Inspire the Next Generation of STEM Professionals. Our goal is to simplify the idea of STEM and remove some common misconceptions. In fact, we hope to convey the message that STEM is part of our everyday activities and life experiences. We endeavour to break-down gender and media stereotypes, demystify “STEM” while providing an experience that sparks excitement in parents and children for STEM focused education. Please join us for an exciting day of STEM learning! Thank You, to the planning committee, presenters, key note speakers, guest speakers and parents for making the Parents As Partners Parent Conference a huge success! Parents as Partners Conference 2016 is a FREE conference. Whether your child is just beginning on their educational journey in elementary school or closer to graduation and planning for the future, there are informative and empowering sessions for parents/guardians and caregivers of students of all ages and all stages of education. As you may be aware, The Toronto District School Board currently includes a Parent Representative on Vice Principal Interview Committees. This is a very important and valuable form of Parent Engagement. If you would like to volunteer to participate in the Spring 2016 vice-principal interviews, please complete the attached form (here) and return as soon as possible. NOTE: Applications are still accepted prior to Feb. 9, 2016. Check back here for updated information about the upcoming training sessions and VP selection process. Thank you to all the amazing parent volunteers, trustees and TDSB staff who made this event a huge success! Check back here for details of the November 2016 Parent Involvement Makes a Difference Conference! The TDSB will be hosting an Online Budget Forum to hear from parents, students and the community on the 2016-17 budget. When: Thursday, March 3, 2016 at 8 p.m. The forum will allow participants to submit questions which will be answered live by Budget staff. Many trustees scheduled budget ward forums to hear feedback from students, parents and the community. Trustees will then vote on a balanced budget plan at their March 22 meeting. Thank you to all those who attended our event on Thursday, February 25th, 2016. We hope all the attending school council representatives found the evening informative and were able to make useful connections. If you didn’t have a chance to fill out a feedback form at the event, we’d still love to hear from you! Your ideas and suggestions are important for planning future events. Download a copy of the 2016 Useful Links for School Councils document, included in the information package given out at the event. This year, the Parent Involvement Advisory Committee (PIAC), Special Education Advisory Committee (SEAC), Mental Health and Well-Being Parent Partnership Committee and Model Schools for Inner Cities’ Parent Academies are thrilled to join together to bring one all-inclusive conference to TDSB parents and caregivers. 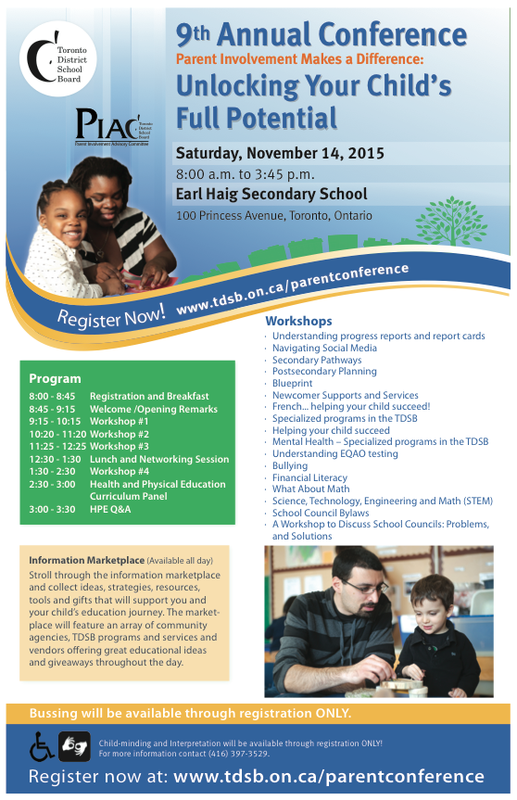 All parents/guardians and caregivers of TDSB students are invited and welcome to attend this FREE conference. The Parents as Partners Conference 2016 is planned by parents, for parents and we are so pleased to be able to offer a selection of 80 sessions that cover a broad range of topics to provide parents with useful information and resources to help children improve their achievement and well-being at school and at home. What is a parent portal ? A parent portal is a web site providing parents with access to student records including achievement, attendance and school communication. The portal will be made available from any internet enabled device including desktops and mobile devices. School Councils can apply online for a provincial grant of up to $1000 to fund parent engagement activities during the 2016-2017 school year. Funds can be used to host parent workshops, bring in guest speakers, run family science/math/literacy nights, produce parent handbooks, pay for babysitting and food for parent meetings, and many other activities that increase parent engagement in our schools. Do you know an exceptional teacher, principal, or other staff member? Parents, students, staff, and community members are invited to nominate a TDSB staff member or team whose work has made a difference in your school. The awards ceremony will be held on May 3, 2016 at 5050 Yonge St. Nominations due by March 22, 2016. The Toronto District School Board (TDSB) has appointmented Suzanne Craig as Integrity Commissioner. Serving the Board of Trustees, the Integrity Commissioner will provide advice on the application of the Board Member Code of Conduct, applicable policies and procedures, and provide information with respect to trustees’ obligations under the Municipal Conflict of Interest Act. Her job is to ensure that all conduct by trustees is held to the highest standards of accountability and transparency. Please check out the February edition of the TDSB “Mental Health and Well-Being Belongs To Us” newsletter. This month’s publication features “Connection = Kindness + Friendship”. The Parent Involvement Advisory Committee (PIAC) is mandated pursuant to the Education Act, Ontario Regulation 612/00, last amendment: O. Reg. 330/10. The purpose of PIAC is to support, encourage and enhance parent engagement at the board level in order to improve student achievement and well-being. PIAC achieves its purpose by: providing information and advice on parent engagement to the board; communicating with and supporting school councils of schools of the board; and undertaking activities to help parents of pupils of the board support their children’s learning at home and at school. Connect with agencies and personnel specializing in the support of children with special needs/gifts and their families. There will be a wide variety in attendance. Connect with other parents of children with similar special needs/gifts, the specific agencies that support them and with TDSB staff in discussion sessions. Learn about specific resources and opportunities. Share challenges, problem solving strategies and success stories. advance registration ONLY – we are unable to provide for walk-in requests. Click on the link below the see the poster and get information to register for this conference.